Like a great number of people, I binged Tidying Up with Marie Kondo when it premiered on Netflix, and I’ve been slowly going around my house, tidying, asking if certain objects ‘Spark Joy.’ My dresser drawers are a thing of beauty, all folded in thirds and stacked vertically. Where I’ve been struggling (even before KonMari entered my world) is my closet and how to store my knits. The problem challenge with knitting so much is having somewhere to put all the new lovely wardrobe additions. This container has fifteen pre-divided compartments, and my shawls and cowls were able to roll up neatly and each has a home. My bigger shawls are also rolled and are placed back into the cube, this time with more order. I still have some space challenges in the closet, and I think they can only be solved with some sort of new dresser or wardrobe, basically I need more shelves. For the time being, this solution works well and makes me super happy when I see it! How do you store your shawls and knits? I’m always looking for new ideas and inspiration! Share your solutions! I have a new favourite knitting project, and I think I’m a wee bit obsessed. Since delving into this knitting obsession hobby, I’ve become a big fan of shawls, scarves and any other neck accessory (neck-cessory?). The problem with shawls is that throughout the day, they shift, they slouch, they constantly need to be adjusted. Enter the bandana cowl. Guys, they are, in my very humble opinion, the perfect cowl. They have interest with the shape – they look like a shawl, but without the fuss of constantly fiddling with the ends. 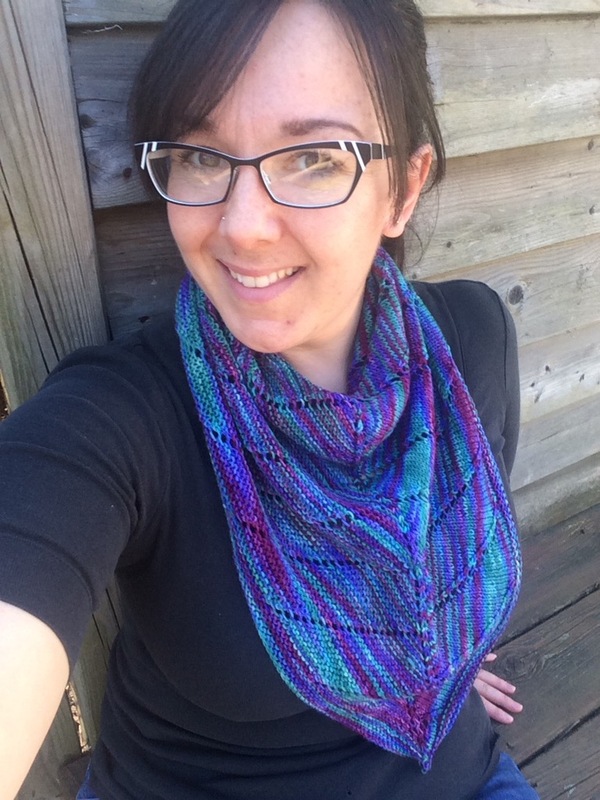 If you choose a simple pattern, the yarn can shine, like with my Escarpment Cowl. The yarn was the fabulous Mineville Wool Project Merino DK Single, named in honour of the Ontario Science Centre, and the colours were truly the star with the rich blues and greens. The simplicity of the pattern, designed by Shireen Nadir of Blue Brick Yarns, truly showcases the yarns. It was designed in mind for her Blue Brick gradients – if you haven’t checked out this indie Canadian dyer yet, please head over to her website. My apologies in advance to your bank account. Even with a more intricate pattern, like Tipsoo Cowl by britt schmiesing, which somehow just FLEW off my needles a few weeks ago, the yarn still can be the star is naturally is (it’s Indigodragonfly, because I know you were curious) and yet the pattern allows for texture difference and adds interest to a knitter who may not always like the appeal of endless rounds of simple stockinette. I’ve been endlessly searching Ravelry for more patterns of this structure. I’m hoping to become comfortable enough with the construction of this accessory to perhaps experience to with my own designs. I end up wearing most shawls wrapped around my neck. These bandana cowls allow for the same look of a shawl without the bulk and without the fuss. Like I said, my perfect cowl. How do you use up your left overs? You know what I’m talking about: those little part balls, left over from that pair of socks or sweater you finished months ago. I’m very much a Type A personality (or as a friend says, Type A++), and I’m super organized, so having these odds and ends kicking about my very precious yarn storage space drives me nuts. When you have a quarter of a skein left, what do you do? It’s not enough to make anything of true substance… but sometimes it’s just enough. I’ve been on a stash busting kick, trying to clear away those part skeins and odds and ends. A few odd balls of DK acrylic are quickly becoming a simple triangle shawl. I may need to buy one more ball to make it a good, proper shawl length. The left over Diamond Tradition from the Soper Creek Yarn Challenge are becoming a quick seed stitch cowl. Finally, those odd sock ends are becoming squares for a sock yarn blanket. I am ultimately pondering if I make it a true sock yarn memory blanket and only make one square with the yarn, or do I keep busting that stash and just make as many little squares with the yarn that I can. Decisions, decisions.